we immerse ourselves in your business's culture and learn about your marketing goals. our outside perspective oftentimes reveals hidden strengths and opportunities that can be leveraged in your marketing strategy. we take a look at your competitors, check out their brands, listen to what they're saying, and determine the best way for your business to differentiate itself. finding the place where your target audience intersects with your brand is a key element of any successful marketing strategy. understanding the role that your business plays in the life of its consumers is necessary to crafting a message that resonates and drives positive results. using the information gathered in the first three phases of research, we develop a detailed marketing strategy with an implementation timeline and short- and long-term benchmarks for evaluating its success. 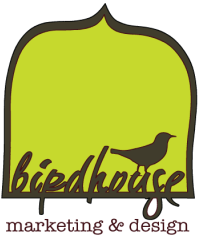 birdhouse marketing & design would love to help your small business with its marketing strategy. contact us today for more information on how we can help your business grow.